The road to O’Malley’s Airport was a long, dusty thin trail that seemed to drift first left, then right, and loop lazily around the cornfields. The airport was a small dry patch of land near Good Hope in McDonough County, a hundred and ninety miles southwest of Chicago. When Pat O’Malley first saw it in the fall of 1918, those seventy-nine barren acres were the prettiest sight he had ever seen. No farmer in his right mind would have wanted them, and none had. The land was dirt cheap, and Pat O’Malley paid for it with most of his savings. The rest went to purchase a beat-up little Curtiss Jenny, it was war surplus, a two-seater plane with dual controls, and he used it to teach flying to the rare visitor who could afford a lesson or two, to fly a passenger to Chicago now and then, or take small cargo loads to anywhere they had to be flown to. The Curtiss Jenny all but bankrupted him, but Oona, his pretty little redheaded wife of ten years, was the only person he knew who didn’t think he was completely crazy. She knew how desperately he had always wanted to fly, ever since he’d seen his first plane on exhibition at a little airstrip in New Jersey. He’d worked two jobs to make enough money to pay for lessons, and he’d dragged her all the way to San Francisco to see the Panama-Pacific Exhibition in 1915, just so he could meet Lincoln Beachey. Beachey had taken Pat up in his plane with him, which had made it all the more painful for Pat when Beachey was killed two months later. 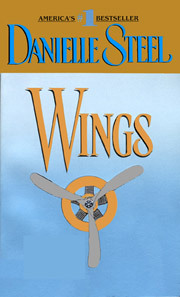 Beachey had just made three breathtaking loops in his experimental plane when it happened. Pat had also met famed aviator Art Smith at the exhibition, and a battalion of other flying fanatics like himself. They were a brotherhood of daredevils, most of whom preferred to fly than to do anything else. They only seemed to come to life when they were flying. They lived it, talked it, breathed it, dreamed it. They knew everything there was to know about all the intricacies of every flying machine ever built, and how best to fly it. They told tales and traded advice, and the most minute bits of information about new planes, and old ones, and seemingly impossible mechanics. Not surprisingly, few of them were interested in anything but flying, nor managed to stay in jobs that had little or nothing to do with flying. And Pat was always in the thick of them, describing some incredible feat he’d seen, or some remarkable airplane that somehow managed to surpass the accomplishments of the last one. He always vowed that he’d have his own plane one day, maybe even a fleet of them. His friends laughed at him, his relatives said he was daft. Only sweet, loving Oona believed him. She followed everything he said and did with total loyalty and adoration. And when their little daughters were born, Pat tried not to let her know how disappointed he was that none of them were sons, so as not to hurt her feelings. But no matter how much he loved his wife, Pat O’Malley was not a man to waste his time with his daughters. He was a man’s man, a man of precision and great skill. And the money he had spent on flying lessons had paid off quickly. He was one of those pilots who knew instinctively how to fly almost every machine, and no one was surprised when he was one of the first Americans to volunteer, even before the United States had entered the Great War. He fought with the Lafayette Escadrille, and transferred into the 94th Aero Squadron when it was formed, flying with Eddie Rickenbacker as his commander. Those had been the exciting years. At thirty, he had been older than most of the other men, when he volunteered in 1916. Rickenbacker was older than many of the men too. He and Pat had that and their love for flying in common. And also like Rickenbacker, Pat O’Malley always knew what he was doing. He was tough and smart and sure, he took endless risks, and the men said he had more guts than anyone in the squadron. They loved flying with him, and Rickenbacker had said himself that Pat was one of the world’s great pilots. He tried to encourage Pat to stick with it after the war, there were frontiers to be explored, challenges to be met, new worlds to discover. But Pat knew that, for him, that kind of flying was over. No matter how good a pilot he was, for him, the great years had come and gone. He had to take care of Oona and the girls now. He was thirty-two, at the war’s end in 1918, and it was time to start thinking about his future. His father had died by then, and left him a tiny bit of money from his savings. Oona had managed to put a little money aside for them too. And it was that money he took with him when he went to scout around the farmlands west of Chicago. One of the men he had flown with had told him about land going dirt cheap out there, especially if it was unsuitable for farming. And that’s when it had all started. He had bought seventy-nine acres of miserable farmland, at a good price, and hand-painted the sign which still stood there eighteen years later. It said simply “O’Malley’s Airport,” and in the past eighteen years, one of the l’s and the y had all but faded. He’d bought the Curtiss Jenny with the last money he had left in 1918, and managed to bring Oona and the girls out by Christmas. There was a small shack on the far edge, near a stream, shaded by some old trees. And that was where they lived, while he flew anyone who had the price of a charter, and did frequent mail runs in the old Jenny. She was a reliable little plane, and he saved every penny he could. By spring he was able to buy a de Havilland D.H.4.A, which he used to carry mail and cargo. The government contracts he got to do mail runs were profitable, but they took him away from home a lot. Sometimes Oona had to manage the airport alone for him, as well as take care of the children. She’d learned how to fuel the planes, and take calls concerning their contracts or charters. And more often than not, it was Oona flagging in someone’s plane for them on the narrow runway, while Pat was away on a flight, carrying mail, passengers, or cargo. They were usually startled to see that the person flagging them in was a pretty young woman with red hair, particularly that first spring, when she was very obviously pregnant. She had gotten especially big that time, and at first she’d thought it might be twins, but Pat knew for certain that it wasn’t twins. It was his life’s dream. . . a son to fly planes with him, and help him run the airport. This was the boy he had waited ten years for. Pat delivered the baby himself, in the little shack he had slowly begun to add on to. They had their own bedroom by then, and the three girls were sharing the other room. There was a warm, cozy kitchen and a big spacious parlor. There was nothing fancy about the house where they lived, and they had brought few things with them. All of their efforts, and everything they had, had been sunk into the airport. Their fourth child had come easily on a warm spring night, in scarcely more than an hour, after a long, peaceful walk, beside their neighbor’s cornfield. He’d been talking to her about buying another airplane, and she’d been telling him about how excited the girls were about the new baby. The girls were five, six, and eight by then, and to them it seemed more like a doll they were waiting for than a real brother or sister. Oona felt a little bit that way too, it had been five years since she’d held a baby in her arms, and she was longing for this one to arrive. And it did, with a long, lusty wail, shortly before midnight. Oona gave a sharp cry when she looked down at it and saw it for the first time, and then she burst into tears, knowing how disappointed Pat would be. It was not Pat’s long-awaited son, it was another girl. A big, fat, beautiful nine-pound girl with big blue eyes, creamy skin, and hair as bright as copper. But no matter how pretty she was, Oona knew only too well how badly he had wanted a son, and how devastated he was now not to have one. “And what about you?” she asked miserably. “You can’t run this place alone forever.” He laughed at her concern, as the tears coursed down her cheeks. She was a good woman, and he loved her, and if they weren’t destined to have sons, so be it. But there was still a little ache in his heart where the dream of a boy had been. And he didn’t dare think that there would be another. They had four children now, and even this mouth to feed would be hard for them. He wasn’t getting rich running his airport. “You’ll just have to keep helping me fuel the planes, Oonie. That’s the way it’ll have to be,” he teased, as he kissed her and left the room for a shot of whiskey. He had earned it. And as he stood looking up at the moon, after she and the baby had gone to sleep, he wondered at the quirk of fate that had sent him four daughters and no sons. It didn’t seem fair to him, but he wasn’t a man to waste time worrying about what wasn’t. He had an airport to run, and a family to feed. And in the next six weeks, he was so busy, he scarcely had time to even see his family, let alone mourn the son who had turned out to be a beautiful, healthy daughter. It seemed as though the next time he noticed her again, she had doubled in size, and Oona had already regained her girlish figure. He marveled at the resiliency of women. Six weeks before she had been lumbering and vulnerable, so full of promise, and so enormous. Now she looked young and beautiful again, and the baby was already a fiery-tempered, little redheaded hellion. If her mother and sisters didn’t tend to her needs immediately, the entire state of Illinois and most of Iowa could hear it. “I’d say she’s the loudest one of all, wouldn’t you, m’dear?” Pat said one night, exhausted from a long round-trip flight to Indiana. “She’s got great lungs.” He grinned at his wife over a shot of Irish whiskey. “It’s been hot today, and she has a rash.” Oona always had an explanation as to why the children were out of sorts. Pat marveled at her seemingly endless patience. But she was equally patient with him. She was one of those quiet people, who spoke little, saw much, and rarely said anything unkind to or about anyone. Their disagreements had been rare in nearly eleven years of marriage. He had married her at seventeen, and she had been the ideal helpmate for him. She had put up with all his oddities and peculiar plans, and his endless passion for flying. Later that week, it was one of those airless hot days in June, when the baby had fussed all night, and Pat had had to get up at the crack of dawn for a quick trip to Chicago. That afternoon when he got home, he found that he’d have to leave again in two hours on an unscheduled mail run. It was hard times and he couldn’t afford to turn any work down. It was a day when he’d wished more than ever that there had been someone there to help him, but there were few men he’d have trusted with his precious planes, none he’d seen recently, and certainly none of the men who’d applied for work there since he’d opened the airport. “Got any planes to charter, mister?” a voice growled at him, as Pat pored over his log, and went through the papers on his desk. He was about to explain, as he always did, that they could rent him, but not his planes. And then he looked across the desk and grinned in amazement. “You sonofabitch.” Pat smiled delightedly at a fresh-faced kid with a broad smile, and a thatch of dark hair hanging into his blue eyes. It was a face he knew well, and had come to love in their turbulent time together in the 94th Aero Squadron. “What’s a matter, kid, can’t afford a haircut?” Nick Galvin had thick straight black hair, and the striking good looks of the blue-eyed, black-haired Irish. Nick had been almost like a son to Pat, when he’d flown for him. He had enlisted at seventeen, and was only a year older than that now, but he had become one of the squadron’s outstanding pilots, and one of Pat’s most trusted men. He’d been shot down twice by the Germans, and both times managed to come in, with a crippled engine, making a dead stick landing and somehow saving both himself and the plane. The men in the squadron had called him “Stick” after that, but Pat called him “son” most of the time. He couldn’t help wondering if, now that his latest child had turned out to be yet another girl, this was the son he so desperately wanted. “What are you doing here?” Pat asked, leaning back in his chair, and grinning at the boy who had defied death almost as often as he had. “Your wife must have loved that,” Nick grinned, and Pat was reminded of all the girls in France who had pined for him. Nick Galvin was a good-looking lad, with a very persuasive manner with the ladies. He had done well for himself in Europe. He told most of them he was twenty-five or twenty-six, and they always seemed to believe him. Oona had met him once, in New York, after the war, and she had thought him charming. She’d said, blushing, that she thought he was exceptionally handsome. His looks certainly outshone Pat’s, but there was something appealing and solid about the older man that made up for a lack of Hollywood movie-star looks. Pat was a fine-looking man, with light brown hair, warm brown eyes, and an Irish smile that had won Oona’s heart. But Nick had the kind of looks that made young girls’ hearts melt. “Has Oona gotten smart and left you yet? I figured she would pretty quick after you brought her out here,” Nick said casually, and let himself into the chair across from Pat’s desk, as he lit a cigarette, and his old friend laughed and shook his head in answer. “I kind of thought she might too, to tell you the truth. But she hasn’t, don’t ask me why. When I brought her out here, we lived in a shack my grandfather wouldn’t have put his cows in, and I wouldn’t have been able to buy her a newspaper if she’d wanted one, which she didn’t. Thank God. She’s one hell of an amazing woman.” He’d always said that about her during the war, and Nick had thought as much too when he’d met her. His own parents were dead, and he had no family at all. He had just been floating around since the war ended, getting short-term jobs here and there at various small airports. At eighteen, he had no place to go, nowhere to be, and no one to go home to. Pat had always felt a little sorry for Nick when the men talked about their families. Nick had no sisters or brothers, and his parents had died when he was fourteen. He’d been in a state orphanage until he’d enlisted. The war had changed everything for him, and he had loved it. But now there was nowhere for him to go home to. “How are the kids?” Nick had been sweet with them when he met them. He loved kids, and he’d seen plenty in the orphanage. He had always been the one to take care of the younger children, read them stories at night, tell them wild tales, and hold them in the middle of the night, when they woke up, crying for their mothers. “They’re fine.” Pat hesitated, but only for a moment. “We had another one last month. Another girl. Big one this time. Thought it might be a boy, but it wasn’t.” He tried not to sound disappointed but Nick could hear it in his voice, and he understood it. “Looks like you’ll just have to teach your girls to fly eventually, huh, Ace?” he teased, and Pat rolled his eyes in obvious revulsion. Pat had never been impressed by even the most extraordinary female fliers. “Egg crates. War junk. Anything I can lay my hands on. There’s a lot of war surplus hanging around, and a lot of guys wanting jobs flying them. I’ve kind of been hanging around the airports. You got anyone working with you here?” he asked anxiously, hoping that he didn’t. Pat shook his head, watching him, wondering if this was a sign, or merely a coincidence, or just a brief visit. Nick was still very young. And he had raised a lot of hell during wartime. He loved taking chances, coming in by the skin of his teeth. He was hard on planes. And harder on himself. Nick Galvin had nothing to lose and no one to live for. Pat had everything he owned in those planes, and he couldn’t afford to lose them, no matter how much he liked the boy or wanted to help him. “You still like taking chances like you used to?” Pat had almost killed him once after watching him come in too close to the ground under a cloud bank in a storm. He’d wanted to shake him till his teeth rattled, but he was so damn relieved Nick had survived that he ended up shouting right in his face. It was inhuman to take the chances he did. But it was what had made him great. In wartime. But in peacetime who could afford his bravado? Planes were too expensive to play with. “I only take chances when I have to, Ace.” Nick loved Pat. He admired him more than any man he had ever known or flown with. “And when you don’t have to, Stick? You still like to play?” The two men’s eyes met and held. Nick knew what he was asking. He didn’t want to lie to him, he still liked raising hell, still loved the danger of it, playing and taking chances, but he had a lot of respect for Pat, and he wouldn’t have done anything to hurt him. He had grown up that much. And he was more careful now that he was flying other people’s planes. He still loved the thrills, but not enough to want to jeopardize Pat’s future. Nick had come here, all the way from New York, on the last dollar he had to see if there was a chance that Pat could use him. “I can behave myself if I have to,” he said quietly, his ice blue eyes never leaving Pat’s kindly brown ones. There was something boyish and endearing about Nick, and yet at the same time he was a man. And once they had almost been brothers. Neither one of them could forget that time. It was a bond that would never change, and they both knew that. “Sounds like you’ve got your hands full.” Nick grinned at him. He loved every word of what he was hearing. This was what he had come for. That and his memories of the Ace. Nick needed a job desperately. And Pat was happy to have him. “This isn’t a game here. It’s a serious business I’m trying to run, and one day I want to put O’Malley’s Airport on the map. But,” Pat explained, “it’ll never happen if you knock out all my planes, Nick, or even one. I’ve got everything riding on those two out there, and this patch of dry land with the sign you saw when you drove in here.” Nick nodded, fully understanding everything he said, and loving him more than ever. There was something about flying men, they had a bond like no one else. It was something only they understood, a bond of honor like no other. 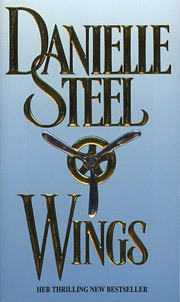 Excerpted from Wings by Danielle Steel. Excerpted by permission of Dell, a division of Random House, Inc. All rights reserved. No part of this excerpt may be reproduced or reprinted without permission in writing from the publisher.